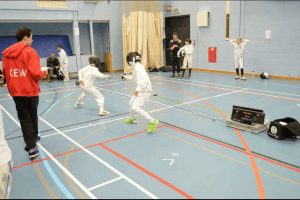 Sam S fenced brilliantly finishing 11th out of a massive field of 23 at the South East Regional Championships which is an excellent result considering it was his first competition and he still has a year in this age group! Sam won 3 and lost 2 in the poule rounds (first to 5 hits) then won his first direct elimination (first to 10 hits) fight. He then lost to one of the top fencers in the region.